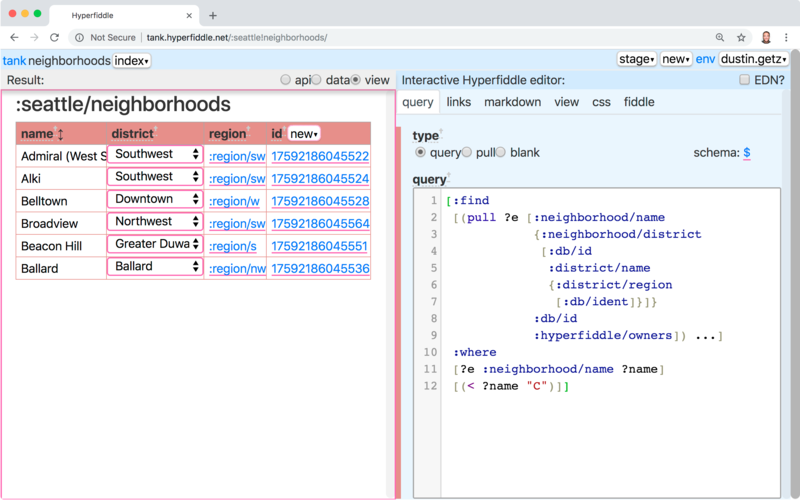 Hyperfiddle is a tool for making web apps backed by Datomic in real-time. What can you make today without any help? The user experience is getting a lot better. There is way too much on the screen at once, and the link editor (top-right) has ten columns in it and you have to understand them all! At this point, our technology is perfectly functional. We are dogfooding and making really complicated stuff. 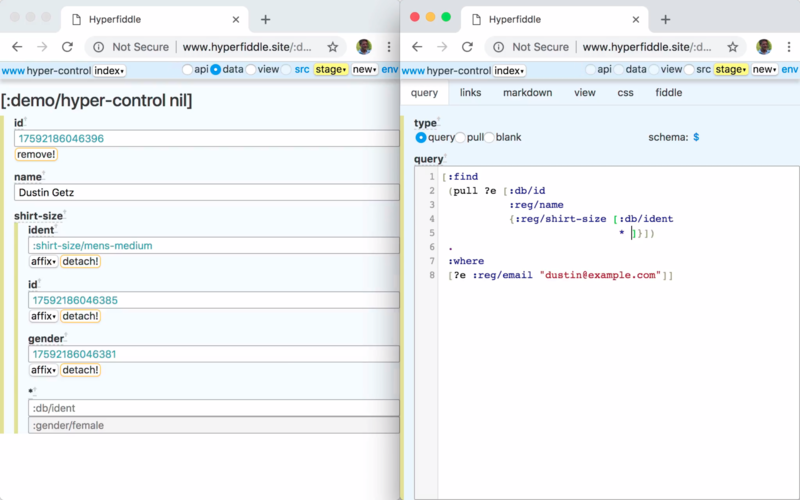 All of our internal tools are done in Hyperfiddle, including Hyperfiddle itself which is bootstrapped. We gave a demo to Cognitect. Present are Stu, Marshall and Jaret. Marshall and Jaret seem really excited ðŸ¤©. Stu is a tough critic. He accurately points out that while Hyperfiddle looks really powerful in expert hands, it feels like it will take many hours to learn. We have a choice: write documentation, or simplify until it is apparent without documentation. Obviously that is no choice at all, we will know we are ready when no documentation is necessary. However Yak shaving is balanced against the need to demonstrate traction for future fundraising, so our July goal is to get in front of users again and figure out which corners need to be shaved. 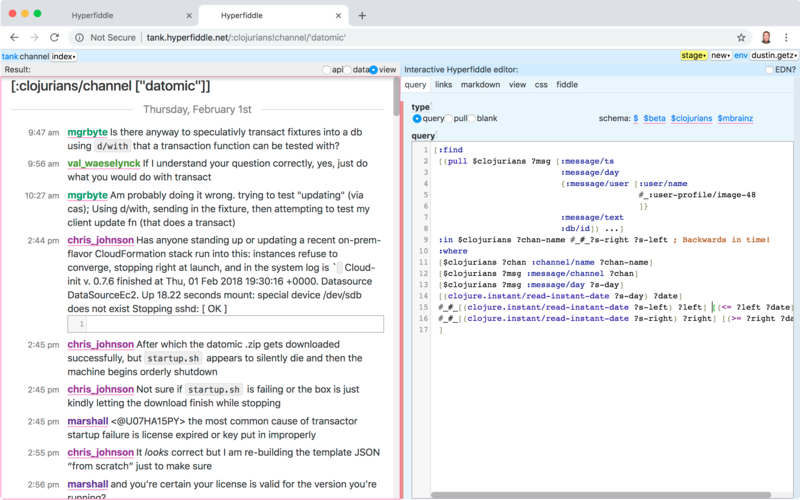 We think Rich and Stu have more exacting tastes for developer tools than pretty much anyone else in the world, so if we can get them to use Hyperfiddle, the hardest and riskiest milestone will be behind us and we can expand from there. At this moment it does not feel like we are particuarly close, but we remain bullish. User testing shows we have a rather embarassing issue: you have to click away from a textbox in order to see the change have an effect. People don't figure this out until I get on video chat and show them this little mouse dance they have to do to get the editor to react (it feels like last hits in DOTA). So basically users are hitting this wall before they've even gotten started. 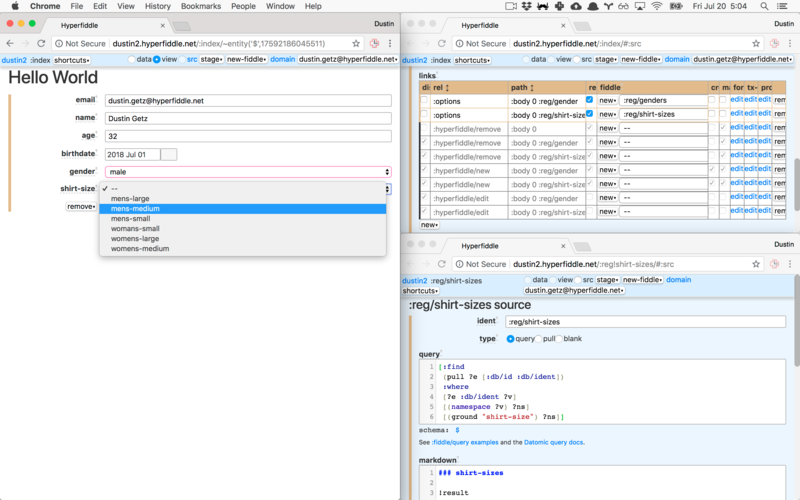 So Karl spends August building out the reactive editor. 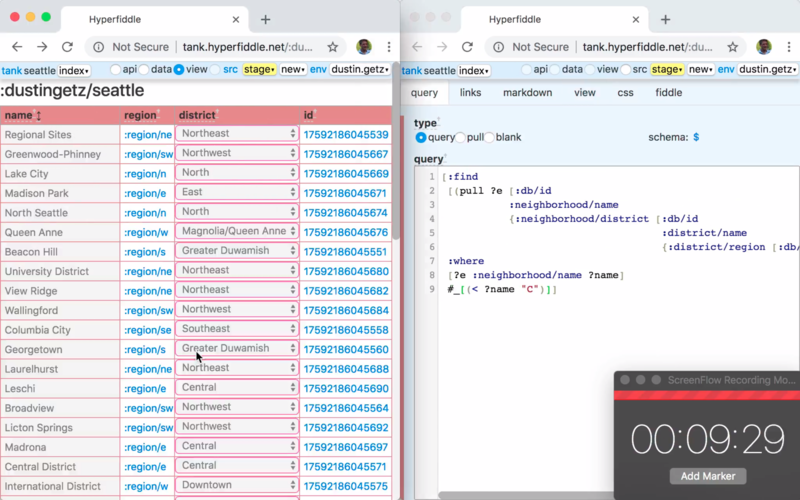 The irony of hearing users tell us how complicated Hyperfiddle is, is that when you compare Hyperfiddle to the scope of problem it solves,Â Hyperfiddle is incredibly simple. Look at all the code you aren't writing! But, to a user, the necessary time investment to learn is balanced against the risk that the thing is overhyped or a toy, and the opportunity cost, etc. The former can be fixed later with money. The latter is fundamental to the way the product works. Our strategy is to punt the fluffy stuff for later, and relentlessly simplify. It is mostly automatic now, you just position a link in the resultset and pick from seven builtin CRUD behaviors and it works. Anything that can be inferred from context, is. The seven behaviors are: :hf/new :hf/remove :hf/affix :hf/detach :hf/rel :hf/self :hf/iframe. You can tweak the behaviors with small Clojure expressions. We auto-generate appropriate entity navigation controls, something a lot of existing Datomic users want badly. This demo is built around Arne Brasseur's slack logger app. I loaded his sample data into Hyperfiddle and built this in one morning. Play with it here. This means we don't have to gate beta access now (finally!). You can just login and start playing. This solves a huge problem which is that the larger the distance between first contact and beta, the excitement fades and the more likely the user is to not get around to trying hyperfiddle. That said, the tank still has problems. Today, in the tank subdomain, you can't interact with fiddles that you didn't create. We're working on a way to let you fork the demos to play with them. We also have a special "demo" subdomain with different rules, but it's not the best. We did a Show HN, which got 120+ points. Some people loved the fast video. Other people are like "what is this i dont know what this is". We met a former YC partner at Conj last year, and finally reach out. He helps us a ton with our YC application and epecially helps us simplify our message and clear up a lot of confusion as to what investors are looking for. We're not exactly bullish on getting into YC right now because our message is still too technical. We do think we are on the path.